Cycling is strictly forbidden in the main city of Venice, but the Lido and other parts of the Venetian lagoon are good for bicycles. The countryside around Venice is good for cycling too. It’s flat, and there’s plenty of historical interest, charming villages and beautiful country roads. See this small group tour for example. If you’re arriving in Venice by or with a bicycle and staying in the historic centre, you’ll need to leave your bike at one of the parking facilities on the mainland or in the less secure one at Piazzale Roma (1 day maximum). You can rent bicycles on the Lido easily in summer. In winter, many of the hire shops are closed, but we found one open on a sunny day in January. As you get off the vaparetto, turn left and walk for about 50 metres to Piazzale S.M. Elisabetta. There is a small street leading off the Piazzale where you find the bicycle shop called Gardin Anna Valli. The bikes were in good condition, and Stefano was very helpful. The telephone number of the shop is 041 2760005, and Stefano’s mobile is 339 6823387. A small group bike tour with a guide is another option. This one gets 5-star reviews. Learn about Venetian history and culture from your expert guide on a leisurely 9-mile/16-kilometre ride away from the city crowds. Venice’s Lido island is flat, so exploring on a bicycle is a wonderful way to see it. If you want a long ride, you can cycle to the southernmost point of the Lido and take your bicycle on a car ferry across to the next island, Pellestrina. Car ferries leave hourly or half-hourly depending on the time of day, and the ferry takes just 15 minutes. Stefano, who owns the bicycle shop, can give you a small map of how to reach the car ferry with a ferry timetable on it. If you have one of the books of vaparetto tickets that you use in Venice, these can be used on the car ferry. Once on the island of Pellestrina, you have a long flat ride of about 9 kilometers to reach the village of Pellestrina. (If you’ve had enough cycling by now, you can always jump on one of the buses on the ferry to continue your journey.) On your left is a huge wall that acts as a sea break. Behind the wall is a sandy beach the length of the island. On your right you will sea various small villages and you can cut down to the sea front to have a proper look at them. The village of Pellestrina is a true fishing village with very pretty brightly coloured houses on the sea front. 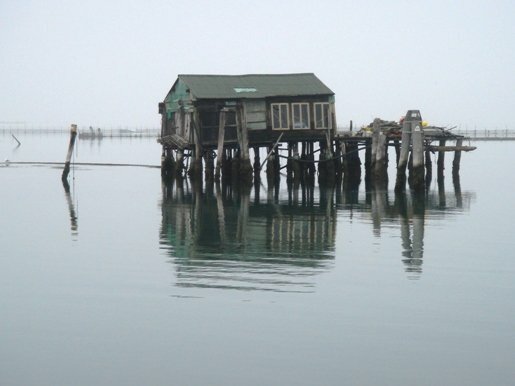 Looking out to sea, you will notice a range of picturesque shacks built on stilts where the fishermen keep their equipment. If you go in winter, make sure to take some food with you. We arrived on a Saturday afternoon in January when nothing was open. It took us quite a while to find one bar selling panini, full of fishermen playing cards. They were all extremely friendly and helpful. There is one restaurant on the sea front, Ristorante da Celeste (Via Vianelli 625, book in advance on tel. 041 967 043/355, closed Wednesdays and all winter) where you can eat some of the best fish dishes in Venice on a deck built out into the sea, and this must be a delightful place to eat in the warmer months. Another alternative for rides is to look at a board on your left when you get off the car ferry on Pellestrina island as this has a couple of suggested itineraries that take three or four hours. For the historically orientated, one is to visit the forts on Pellestrina which are currently being restored after falling into disuse.